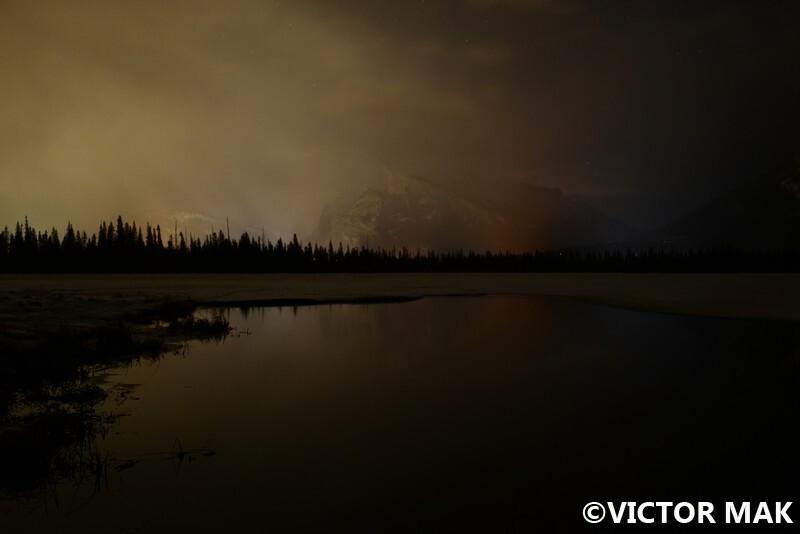 Vermilion Lakes was the last stop on our photo tour and by now we were getting nippy. I stayed up by the road because I didn’t want to climb down to the lake. I’m clumsy and it was a bit slippery so thats a recipe for disaster. Everyone was safe, I just know myself. The clouds were also coming out by now so the night wasn’t as clear. Kinda neat going through our night shots for these last posts. You can see the differences in the sky when it was clear and now cloudy. 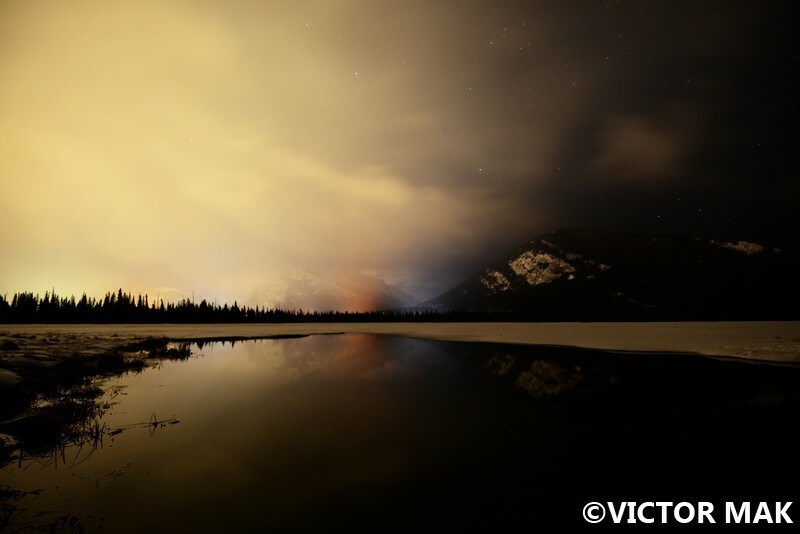 Posted on August 22, 2018 by jebusandandrea	This entry was posted in Canada, Night Photography, North America, Snow & Ice and tagged Alberta, Banff, Banff National Park, Canada, Landscape Photography, Night Photography, Snow, The Great Outdoors, Travel, Vermilion Lakes, Winter, Winter Adventures, Winter Travel. Bookmark the permalink. Dramatic shot! Was it really that dark? Yes, we had flashlights. The clouds were really coming in and that’s light from somewhere in the background but don’t remember from what. I stayed by the car for this one because I thought it may be slippery where they were headed for pics. Vic said it was so I don’t regret hanging out by the car. Knowing me I would have slipped. This trip taught me ice and snow is more brutal on the on the body than hiking! Or at least the hiking we’ve done, I know there’s harder trails that what we’ve done. How’s your summer been? Ours was good but then it got weird in August. My Dad passed away and I haven’t been feeling like my “normal’ self. It was kind of unexpected, kind of not. He wasn’t doing well earlier but perked up quite a bit before we went t the Azores in June. He had a really good last 2 months, his memory was a bit better than usual, more lucid, more mobile. His last I took him to see Ant Man and by the end of the movie that’s when it all went downhill. It happened fast and he didn’t even know he was dying. We’re going to visit my Aunt, my Dad’s sister in CA in a couple months. Have family pics I need to give her and we can go enjoy Halloween stuff out there. It’s been nice reconnecting with family. I haven’t seen some cousins since the 90s. Can’t wait to read about them. I’m a bit behind. Sounds like a great summer.